Brihaspathi Technologies offers the best-in-the-class technology services to small and medium businesses across the world. 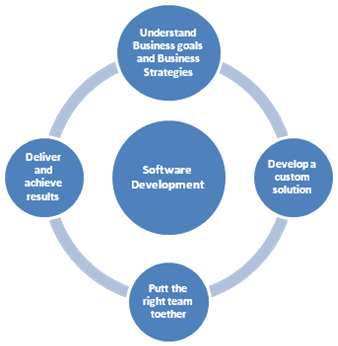 Our established objective is to offer Software Development services that achieve total business transformation. Our objective takes us to offer appealing web design and development, and quality custom application development based on proprietary and open-source tools. We leverage on technologies that are reliable, scalable, contribute to enhancing the bottom-line, and serve the clients immediate needs. The design and development of desktop-based applications has graduated to those that are predominantly based on cloud, mobile and smart interface. Brihaspathi Technologies is in the forefront of taking the client to the next level of technology convergence, with unlimited scope for rapid access, customizability and adaptability of software applications. Brihaspathi Technologies' notable contribution is in enabling businesses to keep abreast with the fast changes - reorganization, expansion, growth, customer expectations, and unpredictable markets. We ensure that all change is answered with the right technology solutions and adoption of the right change management strategy. Our project managers, business consultants and business analysts work as an extension to the client's organization to ensure that the custom and scalable software solution is designed and developed to match the client's overall business strategy. At Brihaspathi Technologies we understand, in a scenario where high quality software development comes for a premium, success is assured for each client only by balancing the right use of technologies with custom pricing models. We offer our clients a choice to make a difference to their business, with the result being to get gainful advantage from cost-effective and innovative technologies, and keep their businesses ahead of competition. Desktop Applications are the things that work offline and run off the web browser. We help you spruce-up your business environment through rich, easy-to-use, easy-to-access, new-generation Rich Desktop Applications (RDAs). Our desktop applications facilitate instant content synchronization, quick file system access and ready management of downloadable content while working offline. Applying our industry expertise and technical experience, we develop Desktop Applications that tone-down the complexity of your business processes, improve your performance and accelerate your business productivity.Desktop applications allow you to work or play on your computer, even when the internet is unavailable. Office applications like Powerpoint or Word, Music players like Winamp or Itunes and finance software like Quickbooks continue to be preferable to web-based alternatives. Services Highlighted: We engage in designing and building Desktop applications that involve Visual Basic development, C# windows Form Applications.